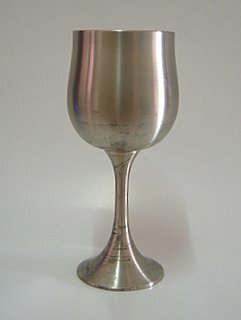 Like tankards, pewter goblets have also been around for centuries. A goblet is basically a standing cup fixed on a stem, which is why it is also categorised as a stemware along with other drinkware such as wine glasses and champagne flutes. A goblet usually has no handle. 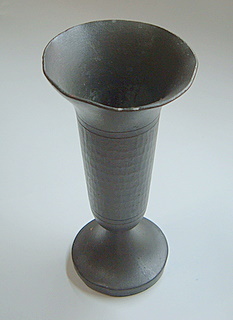 By the way, a pewter goblet is also called a pewter chalice. Historically, goblets were used in religious ceremonies and rituals. In Christianity for example, it is probably one of the most sacred vessels used for worship. The Holy Chalice is said to be the vessel used by Jesus during the Last Supper. In another more well-known version, this is called the Holy Grail. 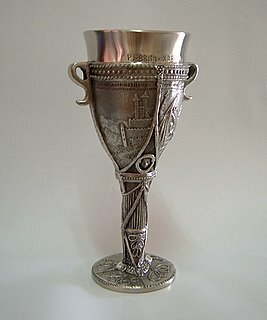 Religious or not, a goblet made of pewter is a wonderful item for use or as a collectible. A goblet can be as plain as the one shown above, or adorned with wonderful artwork like the one below. I absolutely love this goblet. It's a Lord of the Rings collectible, and this one has a Hobbit design with a couple of handles. I got this as a gift and it really kickstarted my interest in pewter collecting. I counted about seventeen designs altogether in this series but there are probably more. Each design is based on an important character in this wonderful fantasy trilogy. This particular Hobbit design is no longer being produced as the mould had been 'retired' at the end of 2002 along with those of Gondolin and Aragorn. So I guess it's collectible value has already increased. The other designs are still available so try to grab one of these pewter wine goblets if you like them. They can be a little pricey though. Now, the goblet above is a rather old one. It is almost wholly covered with tarnish. The stem is very short, and the base is quite thick. It's not in the best condition, obviously. You can see that the rim has already gone out of shape. This goblet has a hammered finish. In fact this is the first hammered pewter goblet I've seen in real life. Of course I can see some images online, but then I haven't actually found too many of these online either. You can also check out other pewter drinkware on this site.